Block toppling represents one of the most common types of instability, specifically structurally conditioned failure within the rock mass. Toppling occurs on slopes in rock masses where the strata dip steeply away from the slope, striking parallel or sub-parallel to it. 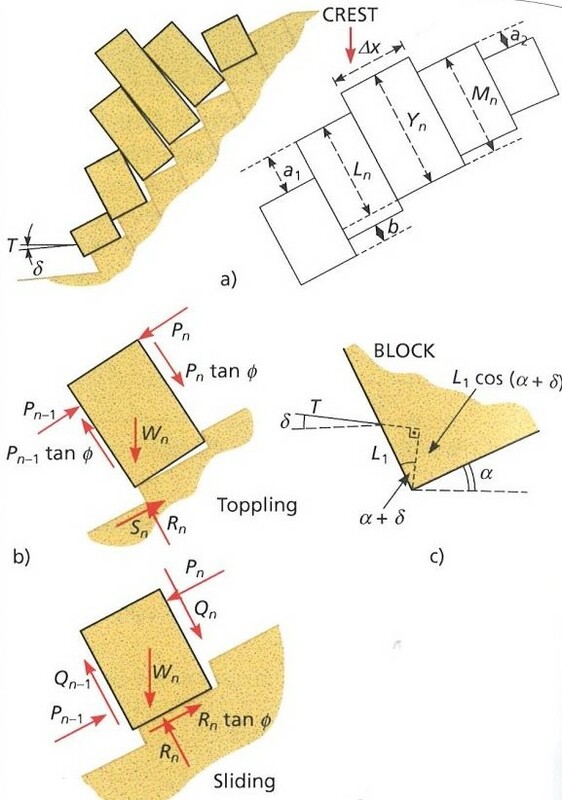 In toppling, rotation of unstable blocks in overhangs occurs due to failure at the slope toe. Discontinuous systems that cause block toppling are usually orthogonal and form unstable “columns” within the rock mass. The stability of the blocks is not conditioned solely by the shear strength of the discontinuities as unstable blocks are also subject to rotational movement. 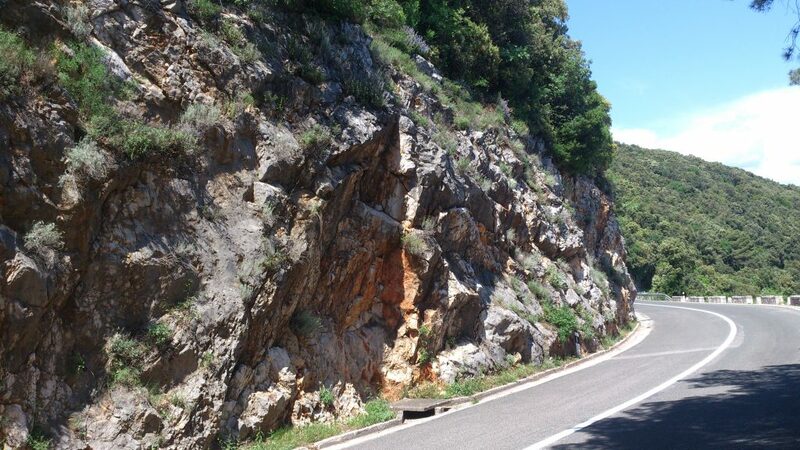 Flexural toppling occurs in rock masses with continuous steep discontinuous systems, whereby individual blocks are broken off due to the rock mass bending forward in the overhanging part. The toppling process may be caused by sliding, excavation or erosion of the slope toe, with instabilities retrogressing back into the rock mass, forming tension cracks. Over the years, Goodman and Bray (1976) and Hoek and Bray (1981) developed analytical methods for straightforward cases of schematic blocks on slopes. More complex toppling cases cannot be represented by simple models and their equilibrium conditions cannot be analysed. Block toppling can be analysed by studying the equilibrium conditions for each block in the slope and calculating the relationships between them, taking into account the mutual interaction and the geometry of the blocks and slope. 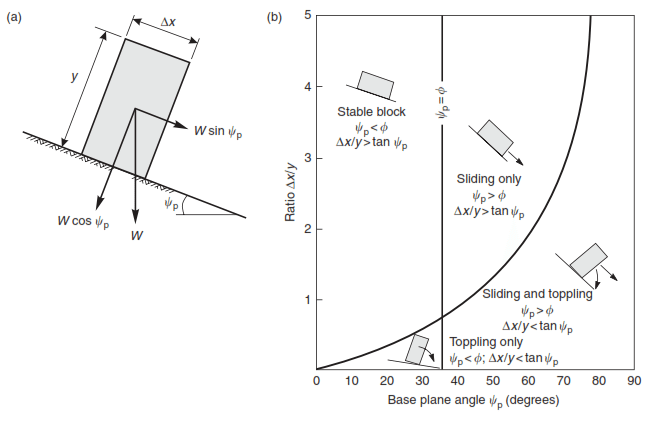 Under certain conditions, each block forming a slope may potentially become unstable due to toppling or planar failure depending on the influence of particular forces and the dimension of the block itself. 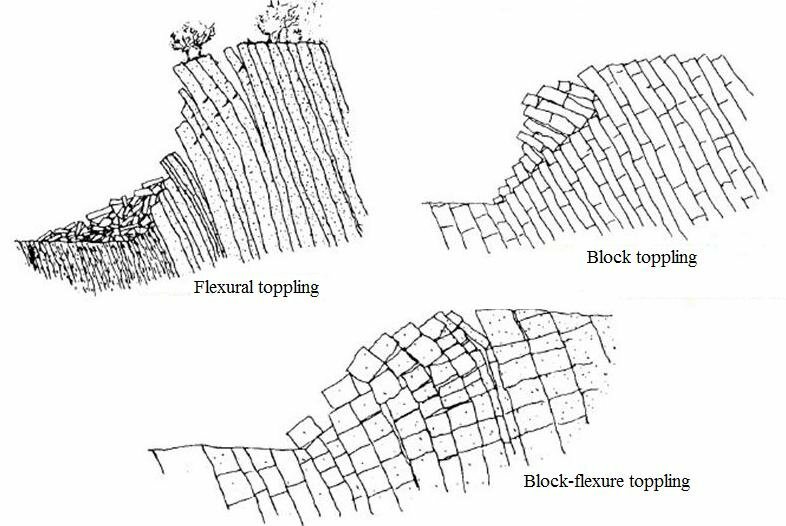 We have encountered many examples of instability in the form of block toppling during the previous slope mitigations. One of the most significant examples of block toppling was elaborated in the detailed design of slope mitigation on the country road ŽC 5062 – locality Guč, near the settlement Bribir. 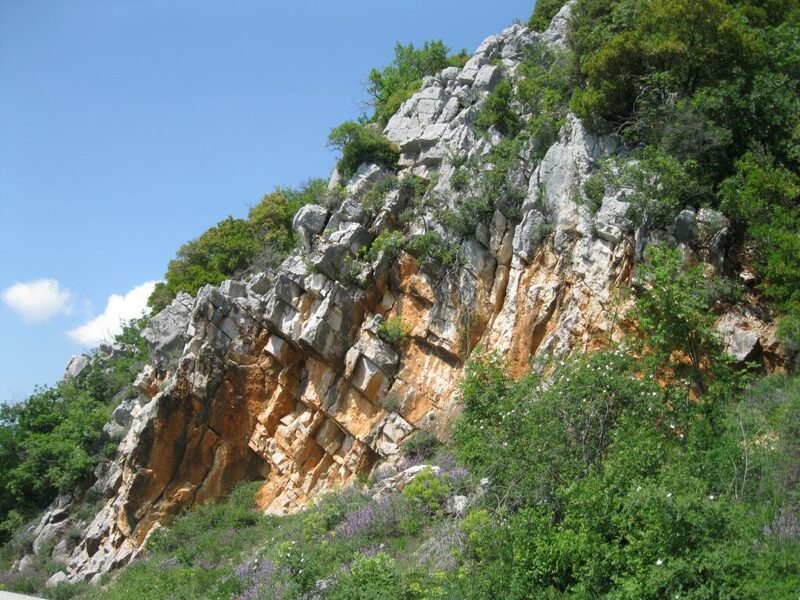 An unstable slope 80 m in length and 5 – 25 m in height was characterized by an existing “scar” of previous rockfall events. 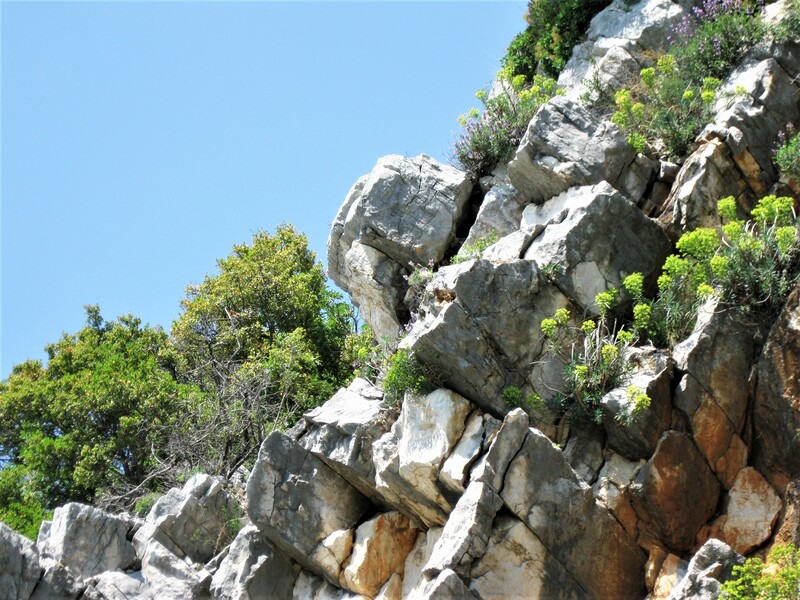 When the rest of the slope was cleared, new – multiple unstable blocks were formed which presented a toppling risk of blocks up to 6,0 m3. The mitigation included cleaning the slope and installing a protective mesh and rock bolts.